With Hillary Clinton finally, definitively running for president, the big question arises: Who will be challenging her in the Democratic primaries? Former Maryland Gov. Martin O’Malley remains a possibility. Elizabeth Warren has ruled out any chance that she will run, despite many a plea. And Lincoln Chafee is exploring a presidential run. But what about the country’s current second-in-command? 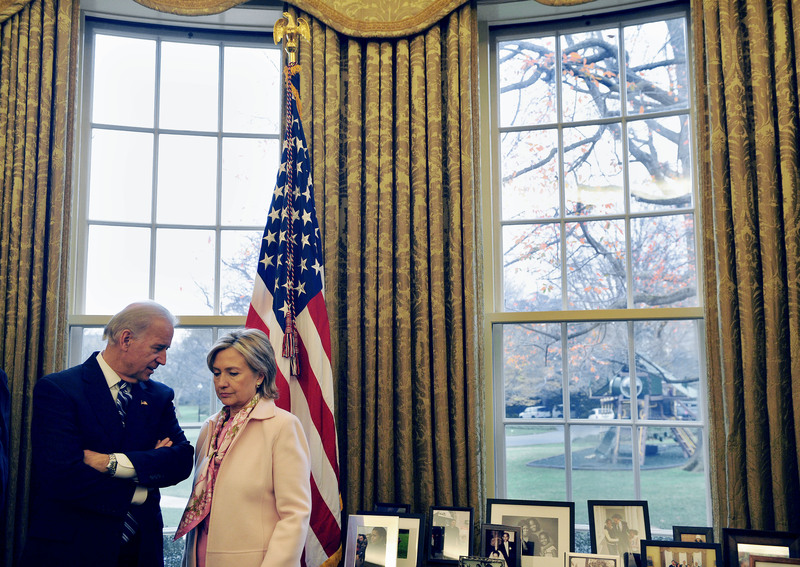 A question on probably everyone's minds right now is will Joe Biden run against Hillary Clinton in 2016? While not everyone, press included, takes Biden completely seriously — think the memes and the Bidenisms — he’s certainly not one to write off entirely. First of all, he's got support. For the first time, Biden supporters stepped up in an organized way last month with the creation of the website "Draft Biden." In the midst of Clinton’s email scandal and Warren’s adamant affirmation that she would not be running, a group dubbing themselves as “former staffers and campaign veterans” gathered more than 20,000 signatures on a petition for Biden to run in 2016, The Guardian reports. And he definitely wants to run for president. Or at least, he's expressed interest in the past. Just a few months ago, back in January, Biden said, “there’s a chance” he might enter the race. Since then, he’s made some moves that suggest he’s still toying with the possibility. In February, Slate reported that when Biden visited New Hampshire, South Carolina, and Iowa, he met with local Democrats and party officials, people who Slate describes as the type of people potential presidential candidates would want to talk to. However, we’ll be left hanging for a while before Biden actually makes his decision. Even though Clinton just announced, Biden has said his decision might not be made until the end of the summer. Part of his reason for that wait was so he could see Hillary’s rollout. Now that that’s happened, Biden is likely one step closer to making up his mind. And Democrats are calling for at least one challenger to Clinton. Democrats understand that having virtually a single candidate heading for the 2016 elections is a risky move. Especially after Clinton's email snafu, some in the party are starting to get worried about finding a back-up option, or even just another contender who would really challenge Clinton in the primaries. While other contenders are on the radar, Biden is one who really has the clout, the resume, and White House insider knowledge to challenge Clinton. Plus, he has the right resume for it, and he's done a pretty solid job as vice president. Biden has been in politics for 46 years, and he has spent the last eight years in the White House. This puts him in a spot unusual to any of Clinton’s other contenders: He’s familiar with the day-to-day of White House life and is a seasoned veteran with affairs on the Hill. During his four decades in the Senate, Biden served as the chairman of the foreign relations committee and assisted with the creation of the Violence Against Women Act. As The Los Angeles Times points out, during his time as vice president, Biden has effectively dealt with oftentimes tense Republican relationships in Congress and the egos of foreign leaders around the world. Moreover, The Los Angeles Times reports that a recent poll by CNN reveals that 71 percent of Democrats view Biden favorably. Moreover, he’s not exactly unfamiliar with campaigning for president either. Although his efforts were obviously unsuccessful in the past, Biden has run for president twice before — in 1988 and in 2008. Maybe the third time could be the charm. However, in the face of all of these pluses lies one big drawback: the enormity of the competition Clinton poses. Even though Biden comes in second place in some polls of possible Democratic primary contenders, he lags behind Clinton’s 62 percent at a meager 15 percent favorability, The Los Angeles Times says. But no matter what the polls say, Biden definitely does hold potential. Some have even contended even if he doesn’t run or if he runs and doesn’t win the primaries, there’s another good consolation prize that might be waiting for him: a second go-round as vice president.